The Reserve Bank of India (RBI) officially adopted inflation targeting (IT) as a monetary policy strategy in February 2015. A few days ago, the government notified a consumer inflation target of 4% to be followed till March 2021. Some economists have expressed fresh concerns about the wisdom of adopting IT. These concerns are misplaced. Inflation hurts everyone in the country from households to firms. Even moderately high inflation is bad for growth as is inflation volatility. The primary objective of monetary policy should be to ensure low and stable inflation. IT offers a framework to achieve this objective in a credible and sustainable manner. The adoption of IT by the RBI is a significant step in the right direction. The RBI should stick to this framework and put in place the operating procedure needed to implement IT. Central banks have the power to print “fiat" money. Unlike money backed by metals such as silver or gold in the pre-World War II era, fiat money gets its value from a legal decree. Every fiat money needs a nominal anchor to tie down the price level. A nominal anchor can take various forms such as money supply, nominal gross domestic product (GDP), value of domestic currency relative to a foreign currency or a price measure such as the consumer price index (CPI). Since the collapse of the gold standard, central banks have tried all kinds of nominal anchors but with limited success. The world has increasingly moved towards inflation targeting where the nominal anchor is the CPI. IT requires a central bank to adjust its monetary policy instruments in response to the gap between the forecast inflation rate and a pre-announced target rate. Most countries today follow a “flexible IT" framework. This gives the central bank discretion to respond to shocks such as a growth slowdown in the short run and meet the inflation target in the medium run. This is the kind of IT framework that has been adopted by the RBI. The objective is to pin down the value of the rupee to the price of the CPI basket. IT anchors the inflation expectations of the private sector. It imposes discipline on monetary policy. Before the adoption of IT, monetary policy in India was conducted in an ad hoc manner. The RBI would target multiple indicators ranging from inflation and growth to exchange rate and trade balance. There was no clarity about the primary objective of monetary policy. The lack of accountability, clarity and transparency in monetary policy introduced uncertainty. Uncertainty about the central bank’s monetary policy objective is a risk factor for the economy. In the absence of a specific mandate to target inflation, monetary policy in India was often used to achieve objectives unrelated to price stability. For example, during 2004-07, in response to a surge in foreign capital inflows, the RBI lowered the nominal interest rate. This was done to prevent the rupee from appreciating. This meant interest rates were kept low at a time when the economy was growing at a very high rate fuelled by a credit boom. A pro-cyclical monetary policy triggered inflationary pressures. 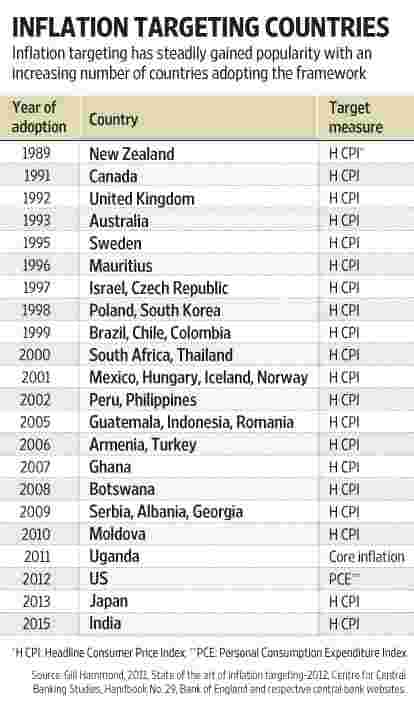 CPI inflation began exceeding 5% from February 2006 onward. Post 2008, in response to double-digit inflation, the RBI pursued successive rounds of monetary tightening at a time when growth had begun slowing down. IT acts as a guard against this kind of a discretionary monetary policy. IT was first adopted by the Reserve Bank of New Zealand in 1989. Since then, the number of countries using IT as a framework to conduct their monetary policy has steadily gone up. As of now, 36 countries, including India, have officially adopted IT (see table). In addition, all 19 countries in the euro zone are bound by the inflation target chosen by the European Central Bank. This takes the total count of IT countries to 55. Since the 2008 financial crisis, questions have been raised about the effectiveness of monetary policy to boost demand in developed countries where interest rates are close to zero. Yet, IT has stood the test of time through shocks, including the 2008 crisis. No country has moved away from IT as a framework and newer countries have adopted it after the crisis. What has changed is not the overarching framework of IT but the instruments used to meet the inflation target. Under conventional IT, short-term interest rates are the instruments of monetary policy. In the post-crisis period, several developed countries started using unconventional measures such as quantitative easing to achieve the inflation target. IT has continued to be the framework used to anchor inflation expectations. A broad consensus supported by empirical evidence has emerged that IT is effective in delivering low and stable inflation and anchoring inflation expectations in developed and emerging countries. The RBI has taken the first step towards stabilizing inflation by formally adopting IT as India’s monetary policy framework. A lot more remains to be done in order for RBI to actually become an inflation-targeting central bank. Equipped with the IT mandate, the RBI needs to focus its efforts on strengthening monetary policy transmission (MPT) and putting in place a comprehensive operating procedure. Unless financial market reforms are undertaken to strengthen MPT, small rate changes will not have any effect on aggregate demand and hence inflation. The RBI should consider bigger changes in the interest rate. Small rate changes of 25 or 50 basis points work well in IT countries that have strong MPT. One basis point is one-hundredth of a percentage point. The RBI needs to build internal technical capacity to forecast inflation using sophisticated econometric models, improve the quality of publicly available macroeconomic data, publish its forecasts of inflation and related macroeconomic indicators at regular intervals, systematically track the private sector’s inflation expectations, form the monetary policy committee (MPC) that will decide the interest rate, and furnish the MPC with necessary information, including data, and models used to forecast inflation. IT is a whole new regime in monetary policymaking in India. The policy focus should now be on understanding how the new regime works and how this framework can be used to deliver low and stable inflation on a sustainable basis.